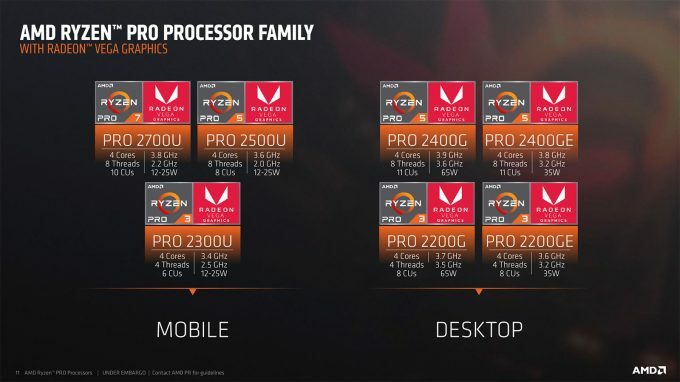 Following the launch of its second-gen Ryzen consumer processors just over a month ago, AMD is back, ready to divulge a whack of information surrounding its second-gen Ryzen Pro desktop and mobile CPUs – and, a whole lot more. If you dig Threadripper, EPYC, or AMD notebooks, there’s something for you here. At AMD’s Silicon Valley headquarters last week, comfortably situated across the street from Intel’s in beautiful Santa Clara, the company had a lot to talk about. On one hand, there were announcements; on the other, there were talk of plans. And lots of them. When the first Zen-based chips hit the market last spring with Ryzen, I’m not sure I personally would have predicted the sheer effort AMD would be putting in to force its way into a dominating situation in multiple markets. In 2017, we saw Ryzen desktop and mobile, Ryzen Threadripper, and of course, EPYC. AMD was very proud of its 2017 for rightful reasons, but last week, it said that 2018 will be even better. Still, at the moment, the company is clearly dealing with an uphill battle, which is to be expected when there’s a decade worth of mindset to combat against on the consumer side. On the enterprise side, it feels like many are waiting to see how the first-gen EPYC fleshes out, and then make a decision when second-gen EPYC arrives – hopefully with more big-name endorsements. To kick off last week’s briefings, AMD delivered a recap of its accomplishments this past year, and drilled it home that the company has a lot of potential. AMD’s current TAM (total addressable market) is about $70 billion, but $30 billion of that is directly related to PCs. Other areas it can tackle include servers, consoles (AMD is in both Microsoft’s Xbox One and Sony’s PlayStation 4), automotive, embedded, and also machine intelligence. 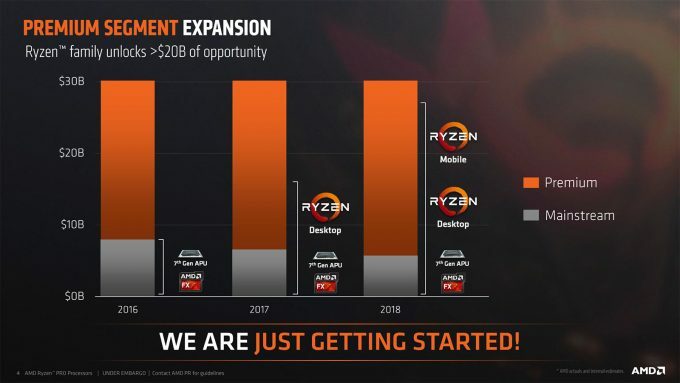 The slide above highlights AMD’s progress in the first year Ryzen has been available. Prior to Ryzen, the company had virtually no “Premium” presence, but Zen changed that in an instant. Once Ryzen Mobile launched, the company began addressing a far greater chunk of the market. Of course, last fall brought AMD’s real slam dunk: true high-end processors for enthusiasts, and enterprise. Threadripper doubled the core count at the $1,000 price point (vs. Intel’s previous-gen), and then EPYC gave us 32-core processors that could be doubled-up in a server to deliver 128 threads. Tasty. In the same way Ryzen for desktop helped AMD permeate the market the best it’s been able to in quite some time, the Ryzen Pro series has followed-suit. In all, these progressions have helped AMD secure a 6x year-over-year increase at retail (Best Buy was name-dropped), and overall, there was a 7x YOY increase in the number of AMD CPUs found inside featured Windows PCs. The latest AMD chips are simply named “Ryzen Pro”, but they’re specifically part of the latest series, so the 2XXX moniker graces them all. All seven of the SKUs announced today include integrated Vega graphics, just like the 2200G and 2400G on the desktop Ryzen side. Each Ryzen Pro model varies in the number of compute units its integrated graphics has, with the desktop parts having either 8 or 11, and mobile, 6, 8, or 10. 2700U (Mobile) 4 (8T) 2.2 GHz (3.8) ??? Dual ≤25W ??? 2500U (Mobile) 4 (8T) 2.0 GHz (3.6) ??? Dual ≤25W ??? 2400G 4 (8T) 3.6 GHz (3.9) ??? Dual 65W ??? 2400GE 4 (8T) 3.2 GHz (3.8) ??? Dual 35W ??? 2300U (Mobile) 4 (4T) 2.5 GHz (3.4) ??? Dual ≤25W ??? 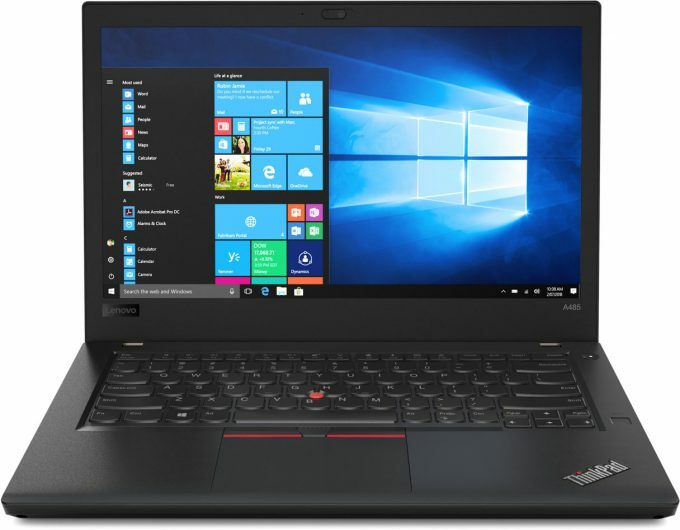 2200G 4 (4T) 3.5 GHz (3.7) ??? Dual 65W ??? 2200GE 4 (4T) 3.2 GHz (3.6) ??? Dual 35W ??? On the desktop side, the top chip is the Ryzen Pro 5 2400G, a 3.6GHz offering that peaks at 3.9GHz under the right workloads. This chip is complemented by the 2400GE, which is the energy-efficient SKU delivering 3.2GHz base and 3.8GHz boost in a 35W power envelope. Both chips include the same 11 CUs, although there’s no telling if they are clocked differently. Under those SKUs are dual Ryzen Pro 3 2200 chips with the same G and GE suffixes. These are likewise adhering to a 65W and 35W TDP, but scale back on the number of threads and compute units offered. On the mobile side, we see a number not found on the Ryzen w/ Vega desktop chips: 2700. The three mobile models vary greatly in their graphics capabilities scaling up to 10 CU found on the 2700U. All three are spec’d at 15-25W to better complement a platform expected to be backed by battery power. Before moving onto the product design wins, let’s take a minute to talk about what sets Ryzen Pro apart from the consumer-focused Ryzen. Similar to Intel’s vPRO, Ryzen Pro caters in as many ways as possible to the business and enterprise customer, putting security above everything else. AES-128 acceleration is built-in, as is GuardMI, a family of technologies that can encrypt the memory, enable secure boot, and run trusted applications through the fTPM (firmware Trusted Platform Module). Other perks brought by Ryzen Pro (I’d love to say RPro, but that sounds too much like Radeon Pro!) include image stability (guaranteeing 18-months of software stability), 24 months of guaranteed product availability, enterprise manageability, and a robust 36-month limited warranty. There’s another thing worth mentioning, and this might make enthusiast ears perk up. AMD admitted that its Ryzen Pro CPUs use the absolute best binned silicon it has, meaning it’s binned to an even higher standard than the consumer Ryzen parts. That of course means one thing: these suckers could potentially prove to be the best overclockers out there. 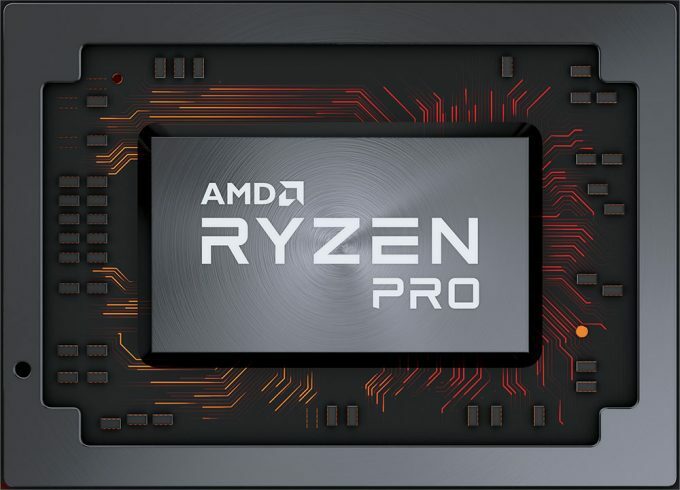 You might be surprised to learn that the Ryzen Pro chips will work just fine in motherboards built around consumer Ryzen, although I’d suggest you check out your vendor’s support page just to make sure you don’t have an oddball board that doesn’t have its EFI updated too often. My AM4 board of choice lately is ASUS’ Crosshair VII HERO, and surprisingly, it has the four brand-new Ryzen Pro SKUs listed on its support page already. That’s being proactive! Whereas AMD’s been facing a challenge of changing the consumer mindset to one that realizes the company’s processors are no longer a weak option, the enterprise is an even tougher nut to crack. That ties into what I said earlier about enterprise-type companies likely holding out before truly considering a platform like EPYC, for example – most companies are not willing to commit millions of dollars to a brand-new platform without all the caveats being known-about from the get-go. In a situation where an IT person needs to deploy a new system, Principled Technologies found that the same number of steps are required to get up-and-running (not a surprise), and that it took no longer to go AMD over Intel. Unfortunately, the PDF linked in the slide doesn’t work, so if I find a working link, I’ll edit it in here. 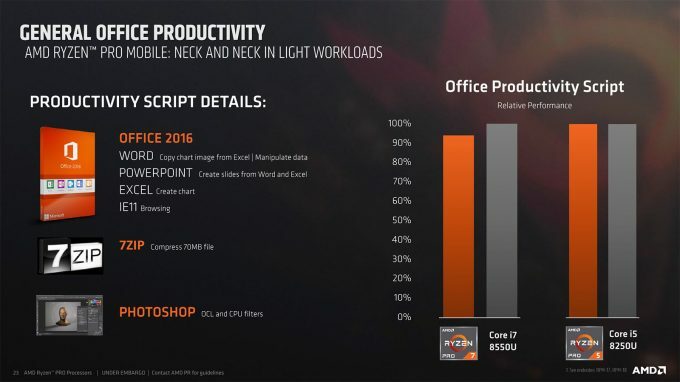 For basic but very popular office apps, like Photoshop, Office, and compression, the performance offered on both the mobile and desktop Ryzen Pros are more than sufficient, and depending on the SKU, eight-threads for most office works are not going to become a bottleneck for at least the next lifecycle, and maybe even another after that. 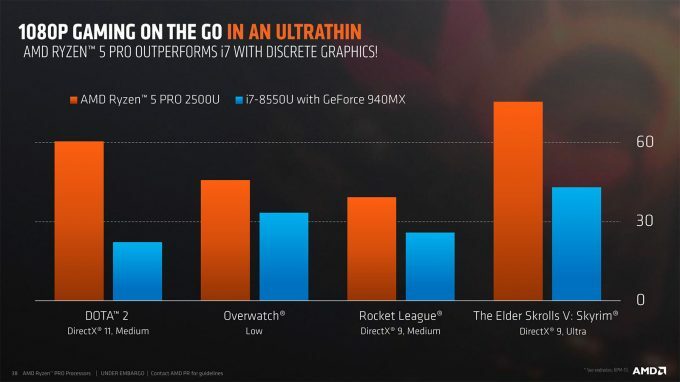 If AMD can’t beat Intel on a CPU test, it’s going to beat it on a graphics test. 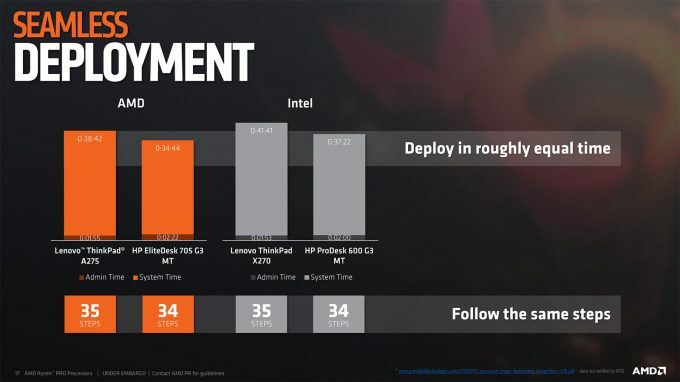 Intel’s IGPs are solid overall, in terms of stability and the like, but AMD offers performance that’s notably going to enhance performance in applications that will take advantage of 3D rendering or compute – such as Adobe Photoshop. There’s a reason Intel has begun releasing 8th-gen Core chips with Radeon under-the-hood. Bringing back an earlier thought, gaming is not at all a priority for most enterprise IT, but the fact of the matter is, our digital lives, and work lives, have changed over the years. Companies like to have happy employees, and employees forced to use a seriously locked-down prison PC will have little reason to smile. Juggling multiple devices is also a chore. According to AMD, and some of its partners also invited to its Santa Clara HQ last week, work has been changing for many to become an all-day thing. That’s not to say that workers are actually working “all day”, but different times of the day work better for some people, so many have begun working from home, jumping on their tasks when they’re most efficient. It’d be nice, then, to have a work notebook that is good to use as a… regular notebook. One that would allow the user to enjoy things like Netflix or a game after a long day. The GPUs on these chips are not too beefy compared to discrete GPUs, but according to AMD, 1080p/30 can be enjoyed in many games, with higher framerates available to aging titles. As alluded to above, AMD had a handful of partners on hand to help proclaim the overall message around Ryzen Pro that it’s a really good platform for business. Microsoft told us about how our work lives have evolved, and how Windows 10 continually iterates to complement that, while Dell, HP, and Lenovo showed off a couple of new product designs. 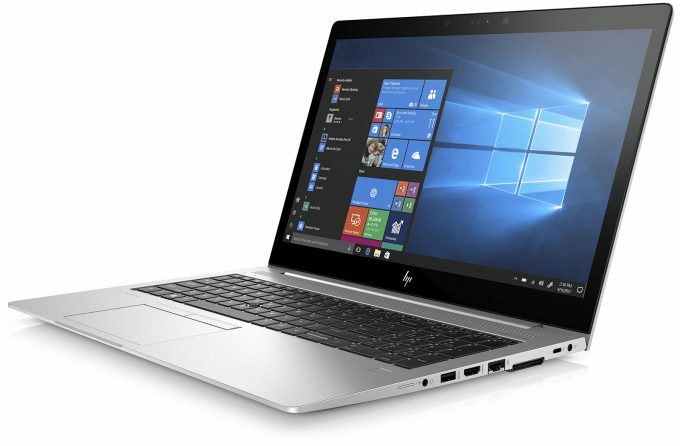 All three vendors showed off product that was attractive in its own right, but the notebook to lure me in the most was HP’s EliteBook 700 Series G5. For starters, it’s pretty freaking sharp-looking for a business notebook. Its features are pretty great, too. The IPS panel has a Gorilla Glass option, for example, and there’s a built-in toggle on the notebook that instantly activates a privacy filter (no more toting one around). Tying into the privacy aspect more, there’s also a slider built into the webcam, to cover it when you are not wanting to be spied on by those with malicious intent; eg: governments or malware creators – though the two are not mutually exclusive. There’s even a few dedicated keys for voice services, including an answer and hang-up button. Skype is the main focus here, but other applications are supported as well, and that support will continue to grow as time goes on. For conferencing, the notebook’s multiple mics should prove useful to make sure everyone in the room is heard. 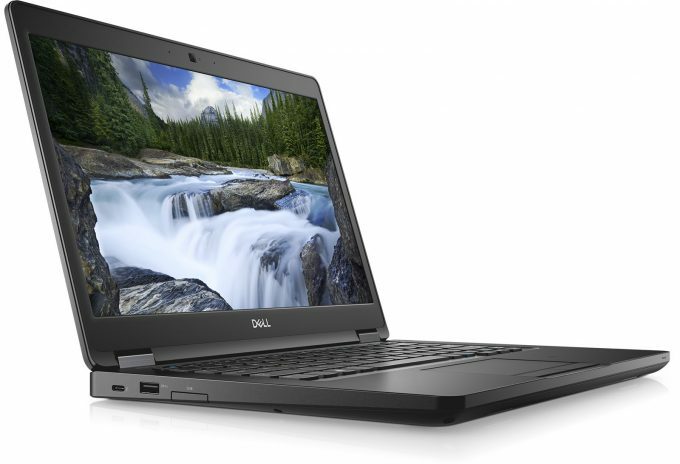 As for Dell, it’s introducing the Latitude 5495, a notebook that’s clearly targeting a slightly different audience than the one above, with its more serious aesthetic. It’s also thicker, and made of “premium materials” to offer strong durability. Speaking of durability, Lenovo’s rep made no secret that he believed his company’s products are well-built. Moments after taking the stage, multiple PCs were casually tossed to the stage, and again throughout the presentation. It wasn’t just the notebook below (the ThinkPAd A485) that met that fate, but even the stand-alone desktop “Tiny” PC. Ultimately, Lenovo is offering both desktops and notebooks to help launch the second-gen Ryzen Pro, with the M715Q TINY being of particular interest, as it’s a mere 1L form-factor, able to be hid out-of-sight behind your monitor. That goes for the cables, too. Ryzen Pro was the main focus of this particular AMD event, but the company wanted to detail some of its near-future, and future plans. 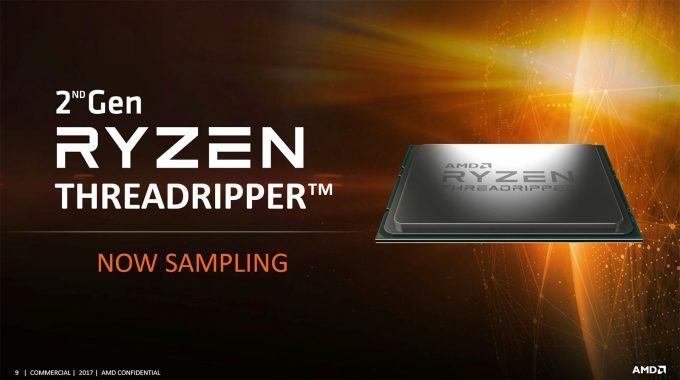 First, the company surprisingly announced that Threadripper’s second-gen chips were being sampled, making a rumored fall release date seem pretty likely. Absolutely no information about specs were provided, but I wouldn’t expect any iterative changes besides those also enjoyed by the second-gen Ryzen and Ryzen Pro chips. When Threadripper was first released, it seemed to largely target gamers, but AMD isn’t oblivious to the fact that its beefiest chips were basically made for workstations. Something I agree with, and plan to evaluate in more detail soon. So, don’t be surprised if you see Threadripper pop-up in more workstation-class machines. ECC memory is even supported for those who require it. And then there’s EPYC, which has enjoyed a twofold increase in shipments between Q1 2018 and Q4 2017, and has been endorsed by the likes of Microsoft Azure, Baidu, Dell EMC, HPE, Cray, and Tencent. 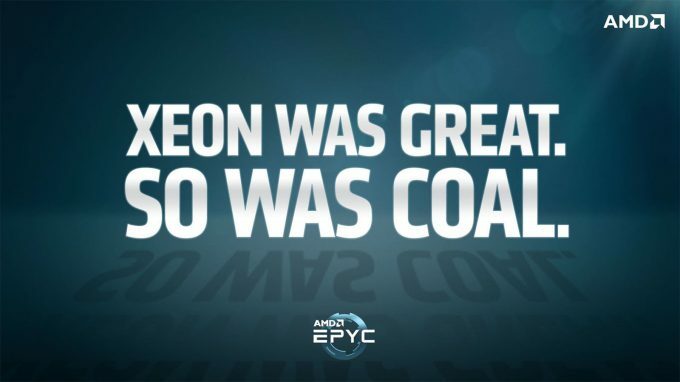 During a wrap-up briefing, AMD boasted about EPYC’s capabilities, with numerous examples of performance gains (over the competition) being seen above. As I’ve never tested EPYC hands-on, I can’t back up this data, but technically, nothing looks off here. Like any Zen chip, IPC can’t match Intel, an issue that’s at its worst with EPYC, due to its lower clocks. However, IPC isn’t everything in enterprise or even some workstation workloads – thread-count can be just as, if not more important. Even with a weaker IPC, 64 threads are getting the job done far quicker than 32 faster ones. AMD still faces an uphill battle to defeat outdated consumer mindsets, so this level of confidence in its product is no doubt going to be noticed by decision-makers. The best part is, there’s no delusion here. 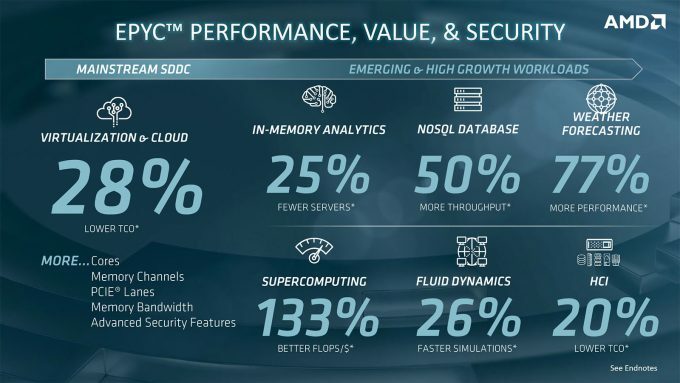 EPYC is a feature-packed, powerful option for the enterprise. Both AMD and Intel admit that the competing platform will beat out their own in certain cases, so as I always like to say… it pays to know your workload. Last, but not least, AMD also said last week that its 7nm Zen 2 microarchitecture design is complete, and that it improves-upon the first Zen iteration in “multiple dimensions”. Looking further ahead, to pre-2020, 7nm+ Zen 3 is “on track”. Further, despite being a CPU-focused event, AMD also said that 7nm Vega designs are complete, and that 7nm Navi is on track – as is the 7nm+ “next-gen” GPU core. At this point, it’s just waiting game to see whether the CPU or GPU 7nm parts arrive first – I’d put my bets on CPU.